So... I decided to homeschool. Yes, yes... I am now a homeschooling mom. Who would have thought that at the age of 45 my age, when I could be celebrating the freedom that [finally] comes after years of having small children and no time to myself, I would choose to dedicate most of my waking hours to homeschooling? Certainly not me! I admit, I did play with the idea often enough, but in my defense, it was much less time consuming and not as difficult in my fantasy vision. 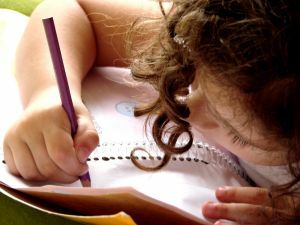 You see, I had this idea that we'd spend a couple of hours or so each day in the books, and then use the rest of our time doing educational activities or maybe spending time with other homeschooling families. Ha! No, it's been a difficult road for this first time homeschooling mom. First of all... my brain has not had to use much of this information in many [many] years. It's hard to locate where it's been stored all this time and apparently my brain isn't very well organized or else the information would be more easily accessible. The first week of school was the worst. I have this problem of being a perfectionist... needing to do things step-by-step and not only that, but lets do it efficiently. Well, that didn't work out very well. I was feeling overwhelmed. We were all tired and frustrated and yes... there were tears... but I am not ashamed to cry in front of my kids! Teaching two different grades is a bit of a challenge. Trying to help one child while the other is working independently would be ideal, but I haven't quite found our 'groove' yet. I am assured that all will be well by the end of the first year. I think that's a mild way of saying that it won't get any better than this. Time is limited. I don't have the luxury of doing laundry, sweeping and mopping the floors, or doing other chores as they are needed [bummer. Yeah, right!] I don't have any 'me' time unless you count showers or the few minutes I spend reading in between assessments...or blogging on into the wee hours of the morning with one eye open and the other searching for the pillow. It certainly is a way of life, but it's a life I enjoy. I get to spend quality time with my kids. I get to watch them learn. I get to keep my mind working and active.... I'm learning! Turns out this really is a great thing. All the 'me' time in the world isn't as valuable as the time spent with my kids. We are now into our 6th week of school and beginning to love it. No, we haven't got a routine down yet. Although we do try. And some days are much longer than others. We are finding ourselves doing 'homework' at night just before bed, in the morning before breakfast, and even on Saturdays. Never on Sundays though... that's a rule. It's a lot of work, and it's hard work. But we are determined and we are pressing on! I am proud of my kids and the progress they are making and I'm so glad we decided to homeschool! I have long held the highest esteem for teachers - be they in the system, or at home. It takes a certain devotion to do it well, and I so admire your persistence. Were I to have children today, I think I'd think long & hard about homeschooling myself. What is offered in the public school system gets scarier & scarier all the time. I have a greater appreciation for teachers after taking on the task of homeschooling. Teaching only two children is hard enough... I can now see why so many kids fall through the cracks in pubic schools. Teachers can't possibly teach and give every child the attention they need in such a limited amount of time. Here in Nevada, the schools are suffering from the budget cuts and yes... what is taught and what is happening in the school system is scary. A big part of our decision to homeschool.